Retired and senior judges provide memories and experiences that help create a history of the Sixth Judicial Circuit. These videos provide valuable knowledge and education that are products of their service on the bench. The judges’ informal recollections offer a historical perspective for their former colleagues, future judges, school civics classes, government officials, Bar associations and the general public. 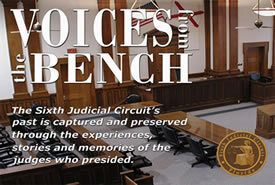 All of the judges featured in Voices From the Bench have retired from the constitutional office to which they were elected. Some remain active as senior judges . . . fully qualified to preside in Florida’s trial courts. Senior judges assist the courts when active judges are ill, have lengthy trials, or if other unexpected situations arise. Florida’s senior judges must maintain continuing judicial education and are approved by a senior judge review board. In the listings below, a title of “retired” indicates he/she is no longer an active judge, and a title of “senior” signifies the judge no longer holds a designated seat on the bench. To view the memories of a particular judge (years of service as a constitutional officer are in parenthesis), select the appropriate link.